Express your love to your sweetheart in the City of Diamonds by sending Valentine Flowers to Surat. Get romantic roses, gerberas, carnations, orchids, etc. in vases, baskets, and floral arrangements delivered anywhere in the city with free shipping from MyFlowerApp. Did you know that in the Victorian Era, men and women would talk through flowers? Every flower has a meaning and significance attached to it. So, this Valentine's Day 2019, express your love for your beloved husband, wife, girlfriend, or boyfriend by sending romantic Valentine Flowers to Surat. Order a bouquet, vase, or basket of red roses to express true love and passion, or get pink roses to portray new love or a crush. Roses are the traditional Valentines Flowers, but there are numerous others too, that can convey your love. Along with your bunch of red roses, you can send their favorite red velvet cake or chocolate cake, or get a cute teddy bear or their favorite chocolates. Orchids are often associated with love and elegance while red carnations suggest deep affection, and white signifies pure love. So, whatever you have in your heart, let it flow through elegant flowers, with MyFlowerApp. Send them anywhere in Surat, including Katargam, Abhva, Udhna, Sarthana Nature park, Valak, Varachha, Adajan, Amroli, Jagdish Chandra Bose Municipal Aquarium, and Rundh. Flowers speak the language of love better than any poems can ever describe. So, on this day of Cupid, let the flowers talk and express your love for your darling by sending Valentine Flowers to Surat. 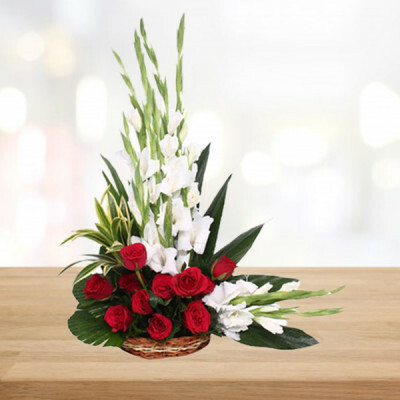 Whether you both are in a long-distance relationship or living together, sending your sweetheart’s favorite flowers online, will definitely fill their day with your love. Maybe add a romantic message like, “Oh, if it is to choose and call thee mine, love, thou art every day my Valentine!” or make it a combo with their favorite cake in heart-shape, chocolates, or some personalized gift added to the mix. Whatever you order, we will deliver anywhere in Surat, including major localities like, Science Centre, Athwa, Magdalla, Vesu, Piplod, Sonari, and Surat International Airport. Apart from letting the flowers speak, you can also get them designed in elegant floral arrangements by our expert artisans and florists. From heart-shaped rose arrangements to ‘I Love You’ arrangements, and from combos of chocolates and roses like Ferrero Rocher Rose Heart to ‘Be My Valentine’ flowers and teddy combos, you can order anything for the love of your life at MyFlowerApp and we will be your Cupid this 14 February 2019. For your diamond, in the city of diamonds, MyFlowerApp will deliver their favorite flowers, combos, and more whenever you want. With our same day and express delivery services, you can easily send off a package at the last minute and we will deliver them within 3 hours. For the ones planning a surprise for your significant other, we also have the options of early morning and midnight delivery.